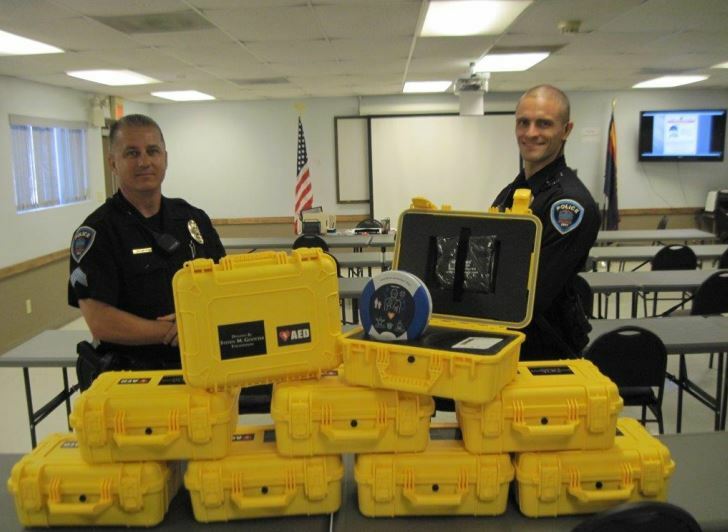 Marana Police Department officers with the HeartSine AEDs. Source: Tucson News Now and Marana Police Department. The lifesaving AEDs, contained in rugged watertight cases, were donated by the Steven M. Gootter Foundation, an Arizona-based organization dedicated to saving lives by defeating sudden cardiac death through increased awareness, education, and scientific research. The samaritan® PAD defibrillators will safeguard the over 35,000 citizens of Marana, as well as employees of the police department in the event of an SCA, a condition in which the heart suddenly and unexpectedly stops beating. When someone suffers an SCA, time is critical. For every minute defibrillation is delayed, the victim’s chance of survival decreases by seven to ten percent. After 10 minutes, typical SCA survival rates drop to zero. Since police officers are often the first to arrive on scene when a time-sensitive cardiac emergency is reported, this is undoubtedly an extremely important and invaluable donation. With 84% of SCA incidents occurring outside of a healthcare setting and striking almost six million lives annually, it is crucial to have access to an AED. The HeartSine AEDs will be stored in rigid watertight carrying cases and kept in the police officers’ patrol cars in case of a cardiac event.